The NFL season-opening game on September 1, 1991 at Three Rivers Stadium featured, in the Pittsburgh Steelers and the San Diego Chargers, two teams hoping to improve on disappointing 1990 seasons. The Steelers had just barely missed the postseason with a 9-7 record in ’90 and were starting their 23rd year under Head Coach Chuck Noll. While the defense had allowed the fewest yards in the NFL, the offense was far less adept at scoring points. The promising but inconsistent Bubby Brister was the starting quarterback and the team was in need of more skill at wide receiver and running back. San Diego was coming off three straight 6-10 seasons, but was restructuring with second-year GM Bobby Beathard. Under Head Coach Dan Henning, the Chargers could run the ball effectively but lacked an experienced quarterback. Second-year QB John Friesz was making his second career start for the Chargers in the opening game. There were high hopes for the defense that included an established star in CB Gill Byrd and a rising talent in LB Junior Seau. There were 55,848 fans on hand for the late afternoon game. On the first series, Friesz fumbled and LB Greg Lloyd recovered for the Steelers at the Chargers’ 27 yard line. RB Barry Foster took off for a 12-yard gain on Pittsburgh’s initial offensive play, but the San Diego defense held. Still, the early break was translated into points when Gary Anderson booted a 38-yard field goal. Two three-and-out possessions by the Chargers surrounded a Pittsburgh series that ended when Gill Byrd intercepted a Bubby Brister pass near midfield. However, a second Byrd interception gave San Diego good field position at the Pittsburgh 29. The Chargers came up empty when John Carney was wide to the right on a 36-yard field goal try. Heading into the second quarter, San Diego finally put together a sustained drive. Starting from their 30, the Chargers moved 49 yards in a 14-play possession that used up nearly eight minutes. Friesz completed four passes and this time Carney was successful on a 48-yard field goal attempt to tie the score. The Steelers responded with an 80-yard drive of their own as Brister was good on all five of his pass attempts, including one of 33 yards to WR Chris Calloway for a touchdown just after the two minute warning. San Diego was unable to generate any threat in the remaining time and Pittsburgh took a 10-3 lead into halftime. The Steelers added to their margin in the first possession of the third quarter. Barry Foster carried much of the load and, after moving 68 yards to the San Diego 12 yard line, Anderson kicked a 29-yard field goal to make it 13-3. Following a short series for the Chargers, Pittsburgh took eight plays to add another three points, this time on a 31-yard Anderson boot. There was no further scoring in the period, and when Anderson added his fourth field goal of the day from 39 yards early in the fourth quarter, it seemed as though the Steelers had the offensively-challenged Chargers firmly in check at 19-3. Taking over at their 19 following the ensuing kickoff, an illegal use of hands penalty called on Pittsburgh gave the Chargers a first down in a second-and-10 situation, and they converted a third-and-ten play when Friesz threw to WR Anthony Miller for 16 yards. Shortly thereafter, RB Ronnie Harmon ran for 23 yards to the Pittsburgh 32 and, following a short gain by RB Marion Butts, Friesz again connected with Miller, this time for 18 yards to the 12. Two plays later, RB Rod Bernstine tossed an 11-yard touchdown pass to WR Nate Lewis on an option play and, with the successful extra point, it was a nine-point game with over ten minutes still on the clock. During Pittsburgh’s next series, Brister was forced to leave the contest due to a mild concussion and second-year backup QB Neil O’Donnell took his place. The Steelers were forced to punt but immediately got the ball back when Friesz was intercepted by CB David Johnson on a long pass play at the Pittsburgh 21. The Steelers held the ball for only three plays, two of them incomplete passes by O’Donnell, before punting it back to San Diego. Taking possession at the 50, the Chargers moved the ball 32 yards in 11 plays highlighted by a 14-yard Friesz completion to WR Shawn Jefferson in a third-and-11 situation. Carney kicked a 35-yard field goal, and with over two minutes remaining, San Diego was in striking distance at 19-13. Following a touchback on the kickoff, the Steelers lost ground on a holding penalty and, after O’Donnell ran for five yards, a delay of game call put them back at their 11 yard line and facing a third-and-19 situation. It seemed likely that the Chargers would get another shot on offense from good field position. 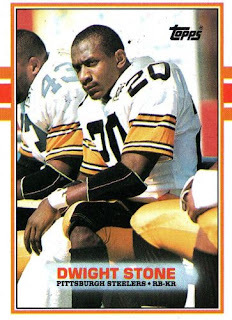 But lined up in the shotgun formation, O’Donnell threw a screen pass to WR Dwight Stone, who proceeded to go 89 yards for a touchdown - it was the game’s biggest play and sank San Diego’s hopes. The Chargers scored once more at the end, with Friesz passing to Jefferson for a five-yard TD, but it had no effect on the outcome as Pittsburgh came away with a 26-20 victory. The Steelers outgained San Diego (390 yards to 281) although the Chargers had more first downs (20 to 16). Each club turned the ball over twice. Bubby Brister completed 13 of 21 passes for 189 yards with a touchdown and two interceptions before having to leave the game. Neil O’Donnell was successful on only one of his four pass attempts, but it was a huge completion for the 89-yard game-clinching TD. Thanks to the long scoring play, Dwight Stone gained 124 yards on his four catches. Barry Foster rushed for 78 yards on 17 carries. For the Chargers, John Friesz went to the air 41 times and had 19 completions for 192 yards with a TD and an interception. Nate Lewis had 6 pass receptions for 74 yards and a touchdown and Anthony Miller was right behind with 5 catches for 54 yards. Rod Bernstine gained 50 yards on 12 rushes and also had the one touchdown pass. Despite the opening win, it proved to be another disappointing season for the Steelers, who started off at 3-2 but then lost four straight games on the way to a 7-9 record in Chuck Noll’s last year at the helm. San Diego went a dismal 4-12 to fall to the bottom of the AFC West. Dan Henning was also replaced for ’92. Bubby Brister returned to the starting lineup for the Steelers, but a knee injury cost him half the season. Neil O’Donnell was the statistically better quarterback and, in 1992, displaced Brister permanently from the starting lineup. Dwight Stone ended up catching 32 passes for 649 yards (20.3 avg.) and five touchdowns.